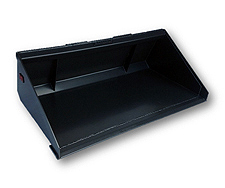 NAI manufacturers various styles of material buckets used to perform multiple applications. Each bucket attachment features strong durable construction and is built from ¼ inch A-36 steel. The Long Bottom Bucket features a 3/4 inch x 6 inch cutting edge and 1/2 inch wear strips. All buckets come standard with a safety tread step. Low Profile 21" 27 1/2" 60", 66", 72", 78", 80", 84", 96"
Long Bottom 21" 33 1/2" 60", 66", 72", 78", 80", 84", 96"